If you see your pup about to eliminate somewhere other than the designated area, interrupt her immediately. Say "wait, wait, wait!" or clap your hands loudly to startle her into stopping. 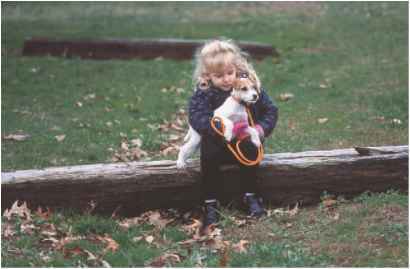 Carry the pup, if she's still small enough, or take her collar and lead her to the correct area. Once your dog is in the potty area, give her the command to eliminate. Use a friendly voice for the command, then wait patiently for her to produce. The pup may be tense because you've just startled her and may have to relax a bit before she's able to eliminate. When she does her job, include the command word in the praise you give ("good potty"). The old-fashioned way of housetraining involved punishing a dog's mistakes even before she knew what she was supposed to do. Puppies were punished for breaking rules they didn't understand about functions they couldn't control. This was not fair. While your dog is new to housetraining, there is no need or excuse for punishing her mistakes. Your job is to take the dog to the potty area just before she needs to go, especially with pups under 3 months old. If you aren't watching your pup closely enough and she has an accident, don't punish the puppy for your failure to anticipate her needs. It's not the pup's fault; it's yours. In any case, punishment is not an effective tool for housetraining most dogs. Many will react to punishment by hiding puddles and feces where you won't find them right away (like behind the couch or under the desk). This eventually may lead to punishment after the fact, which leads to more hiding, and so on. Instead of punishing for mistakes, stay a step ahead of potty accidents by learning to anticipate your pup's needs. Accompany your dog to the designated potty area when she needs to go. Tell her what you want her to do and praise her when she goes. This will work wonders. Punishment won't be necessary if you are a good teacher. What happens if you come upon a mess after the fact? Some trainers say a dog can't remember having eliminated, even a few moments after she has done so. This is not true. The fact is that urine and feces carry a dog's unique scent, which she (and every other dog) can instantly recognize. 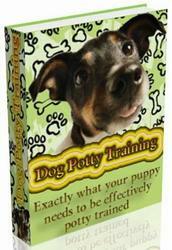 So, if you happen upon a potty mistake after the fact you can still use it to teach your dog. Praising your pup every time she eliminates in the right place will help her remember what you want her to do. Take your pup and a paper towel to the mess. Point to the urine or feces and calmly tell your puppy "no potty here." Then scoop or sop up the accident with the paper towel. Take the evidence and the pup to the approved potty area. Drop the mess on the ground and tell the dog "good potty here," as if she had done the deed in the right place. If your pup sniffs at the evidence, praise her calmly. If the accident happened very recently your dog may not have to go yet, but wait with her a few minutes anyway. If she eliminates, praise her. Afterwards, go finish cleaning up the mess. What happens if your dog has pups everytime she is in season?